Shield provides its customers a supercharged privacy and identity security suite. PC Privacy Shield includes an award-winning technology and professional grade tools to protect your online privacy. PC Privacy Shield was developed to keep your private information private by wiping out your online digital footprint, browsing history, file and program usage and messaging records. PC Privacy Shield is able to erase either all of your data or only specific data, according to your choice. The software also enables fraud or dummy information embedding within the history files. PC Privacy Shield also empowers a completely automated mode in which the privacy suite protects your sensitive information and private data on a set schedule that the user is able to create. PC Privacy Shield also enables its’ customers to select only specific categories and files to be scanned and cleaned or simply let the PC Privacy Shield run automatically. PC Privacy Shield offers a quick scan that checks for privacy risks, exposed information and private data that can be exploited by others. What does PC Privacy Shield highlight? PC Privacy Shield ensures that its users leave no traces of private online activity on the Internet and their computer or laptop. PC Privacy Shield helps to prevent phishing and identity theft. The software identifies and stops hackers, fraudsters, scammers and more. PC Privacy Shield also ensures that your personal and private data stays private. It protects your PC from intruders and unwelcome visitors. PC Privacy Shield also will delete and remove cookies that advisers like to place on your browser to track and learn about your online activities and habits. What does PC Privacy Shield offer? PC Privacy Shield offers its customers a special feature which enables users to automatically get rid of the specific sites you have visited from your history after the browser is closed. For instance, users can selectively remove your bank account or other sites they wish other users of the PC would not be aware of. PC Privacy Shield secures your privacy and protects your profiles against identity theft, by revealing where your phone number, email, physical address or credit card credentials are stored on the computer. PC Privacy Shield also performs a full scan in order to protect your usernames and passwords that are logged on your browser. Users are able to remove them and make sure they will not stay on the computer every time you log into. The feature works on the most popular browsers including Internet Explorer, Mozilla Firefox, Google Chrome, and Safari. 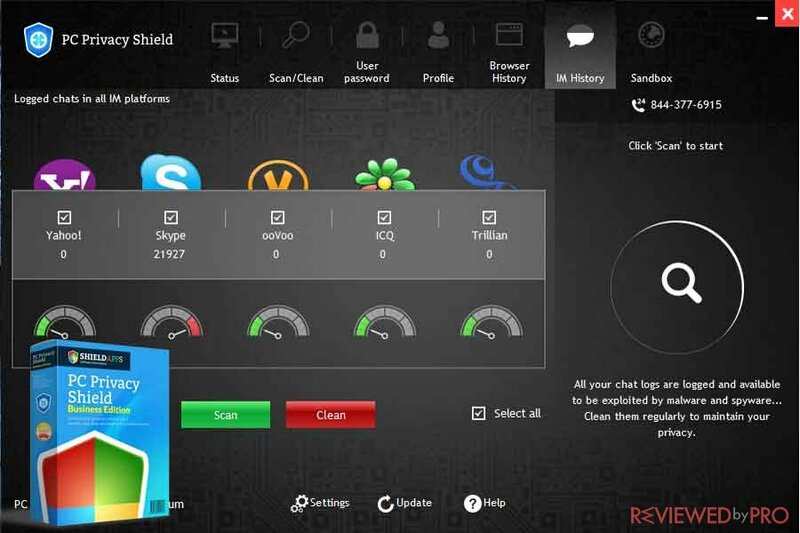 PC Privacy Shield also allows you to easily scan your PC for any suspicious programs or potential cyber threats. The dashboard will display and notify you of any vulnerabilities on your PC and reveal potential security and privacy issues. In addition to privacy protection, PC Privacy Shield also detects malicious and suspicious threats in real time and allows users to remove them before they infect the system and cause any harm. 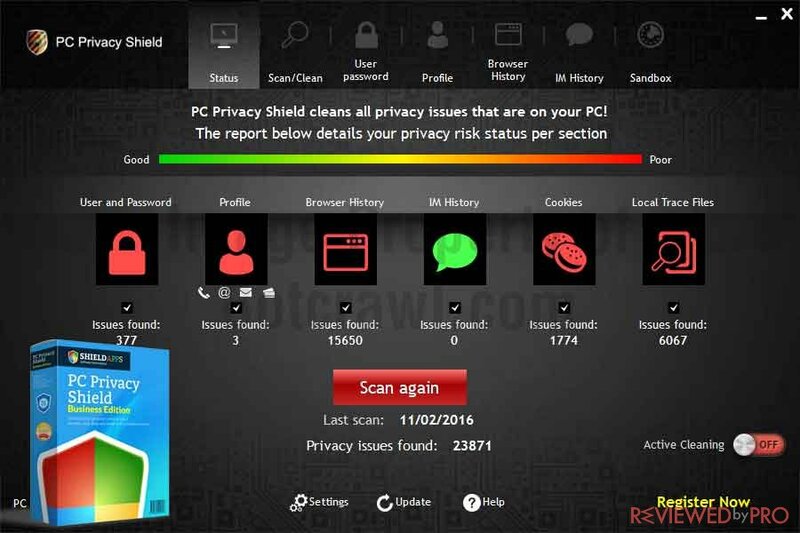 PC Privacy Shield will search and detect any unwanted cookies that are found on your PC. As a result, you will be protected from advertisers and malicious hackers that aim to track your computer activity and browsing habits. PC Privacy Shield will enable you to clean your PC anytime and schedule automatic cleanings. This way you will ensure you that your PC and system is malware-free and clean. Finally, PC Privacy Shield will enable you to selectively delete or replace websites that you have visited or remain stored in your browser history. PC Privacy Shield is compatible with PCs that run Windows XP, Vista, 7, 8 and 10. 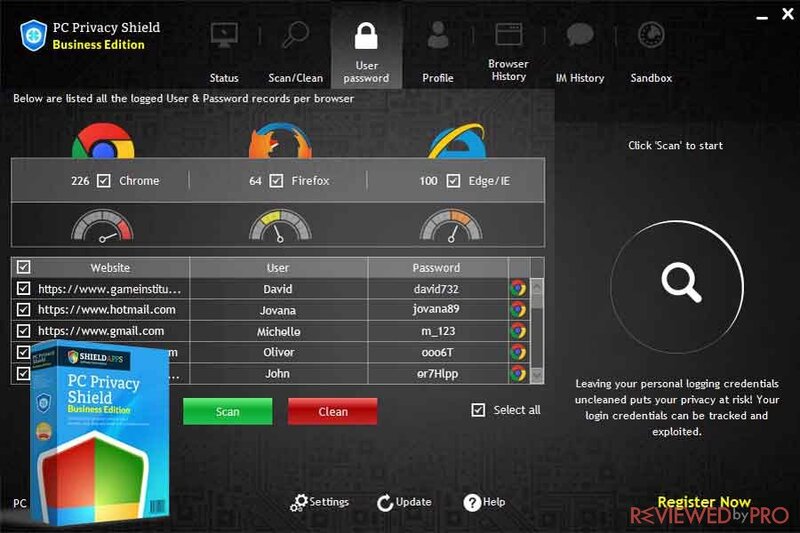 PC Privacy Shield is used by over 8 million active PC users and detects and tracks over 300,000 logs daily. PC Privacy Shield was developed by ShieldApps, the international security software development company. ShieldAppd is focused on helping individual consumers enhance their computer and laptop security, privacy and performance. ShieldApps has over 10 years of experience in the software development and reselling markets. In addition, the company has established a spotless reputation within the technology industry by supplying national and international companies with ShieldApps products and services and by providing a number of home users with top-tier software that ensures security, privacy, and a smooth experience with ShieldApp products and services. ^ PC Privacy Shield. ShieldApps. 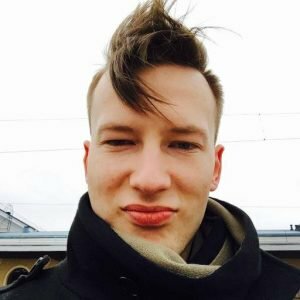 ^ About Shield Apps. ShieldApps. This entry was posted on 2018-01-23 at 10:19 and is filed under News.